The Banker Tan is a 13-inch tall Men's western boot with a vintage touch. Its polished rustic tan leather exterior reveals a golden brown sheen throughout giving this boot an stonewashed effect. This boot features a tonal stitch pattern along the upper for subtle detail and medium round toe for a relaxed fit. The unit heel is crafted to feel comfortable in and out of the stirrup and the cushioned insole provides support for the foot throughout the day. I own a pair of men's 8.5 D Nocona boots, so I know what they are supposed to feel like. The last pair I purchased (on sale) was severely indented on the outer ankle area of the right boot. It was noticeable just by looking inside the boot and should have been caught in the inspection process. Needless to say I'm disappointed because now if I want to purchase these boots again (after returning this pair), I will have to pay $45 more than the sale price. I had to buy anoter pair! I was so happy with the pair I bought in black I had to buy a pair in Antique Tan. These boots fit great out of the box and once they are broken in they are extremely comfortable. When I wear them to work they are on my feet for twelve hours and I almost don't want to take them off when I get home. As a rancher I appreciate durability, comfort and style. Noconas work hard and look great. My oldest pair is 30+ years old, resold numerous times, still going strong. Highly recommend these boots. Bought these boots back in 2005 and have loved them ever since. My style has changed over the years but I always looked good in these beautiful boots. Best looking and most comfortable footwear I've ever owned for the money. Antique tan color is a real authentic "cowboy" color with no cheapie red mixed in. 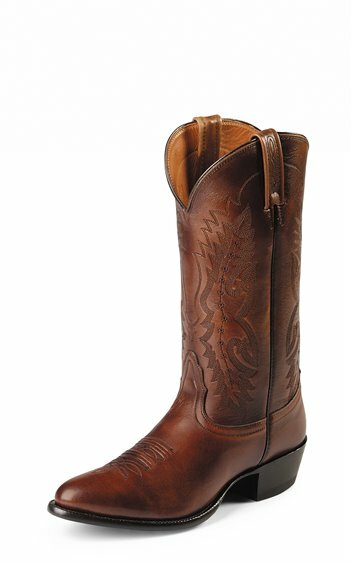 I've own several pair of Nocona Boots and these are one of my favorites. I bought a pair in this style and have had them for about 10 years now. I've got an older pair of Nocona's that I've had for 20+ years and have had re-soled about 3 times and am still wearing.... LOVE Nocona Boots!!!!!!! I have owned Nocona boots for the last 40 years. I have a very high instep and Nocona is the only boot that is comfortable to put on, wear, and take off. This last 15 year-old pair has been re-soled three times and now my pinky toe is going thru the side. I am distressed that my favorite elk skin boot is no longer available. I have another 6 year-old pair of calf skin that is wearing very well also but has not stretched in the width enough to not pinch my toes too much. We are ranchers and our boots are referred to as Noconas because that is all we wear. When we work or play we all get our Noconas on and proceed with gusto. The comfort, quality and durability are adjectives that describe our Noconas. Only bought one pair last year, terrible fit, took them back and replaced them with Lucchesse.